I don't know about you, but sometimes you just know the perfect gift to knit someone. So, when my dear friend, JC, revealed her pregnancy, I knew she needed some baby bibs. 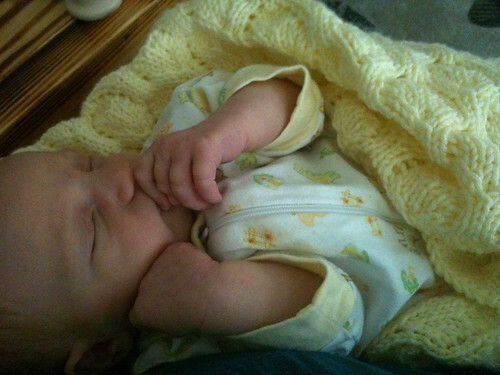 She has oohed and aahed over many a baby bib on this blog, so I knew I had no choice but to knit her some! I think little the little baby boy growing in her uterus will get good use out of them! The pattern is the Baby Bib O' Love pattern from the freakin' fantastic Mason Dixon Knitting book. One I knit with just plain garter stitch, one I knit with a little checkerboard pattern on the bottom, and one I took the Baby Genius Burpcloth pattern and made it into a bib. JC was very excited to receive these bibs. And it made me want to squee that she loved them so much. After writing up the Carefree shawl pattern, I couldn't help myself. I had to knit another one. This time, I knit it out of a skein of Malabrigo Sock yarn. I have had this yarn for awhile. I kept starting things with it, but every time I didn't think it looked good. So, it was to the frog pond. Finally, a successful pretty thing with this yarn. I am quite pleased. I think this yarn might be one of the best to knit little shawls out of. Not at all itchy and it's so squooshy and the colors are just beautiful. Like my Carefree shawl? Want to knit one of your own? You can get the pattern as a Ravelry download for $6! :) Just click the buy now button below! Other things are being finished too. Finally, the knitting bug has returned. A Cozy Stealth Knitting Project Revealed. 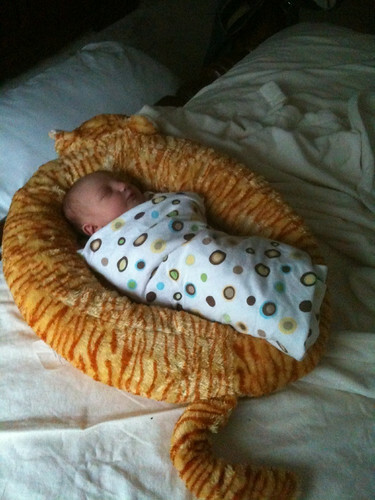 Well, I knew my sister wanted a nice baby blanket for the baby that was growing in her uterus. And, I had knit a car seat blanket. But that's just not the same as a blanket blanket. You know what I mean. 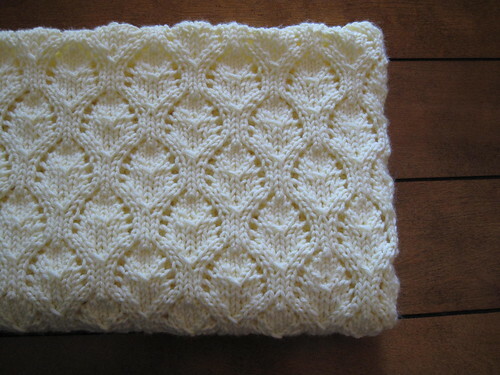 Anyway, I had seen this pattern on Ravelry, and I just fell in love with it. Every single one I had seen knit up was so pretty. It's the Baby Chalice Blanket. 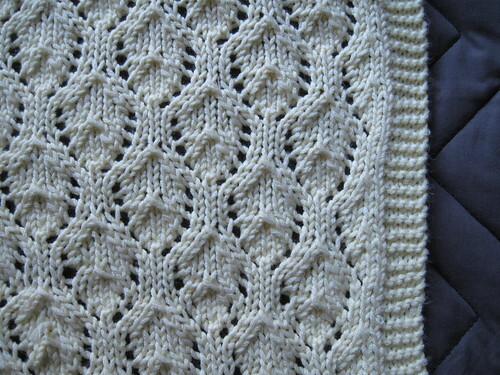 I love that it is lacey enough to be interesting, but easy enough I could knit it quickly. I did a little math and made it about twice as wide as the pattern called for. 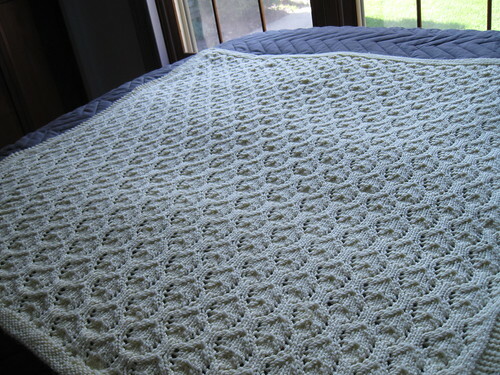 The result was a nice big cozy baby blanket for baby Caitlyn to enjoy. 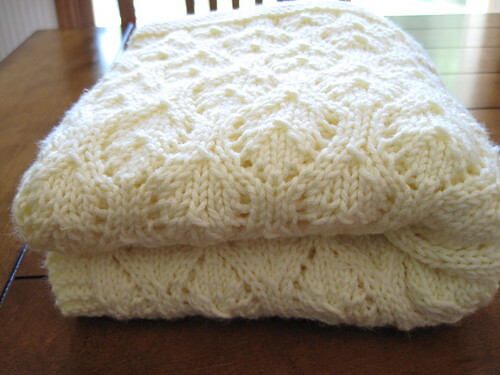 I knit this out of Berroco Comfort in that beautifully named color 9706. I used five skeins. I love the way it came out and totally has me hooked on baby blankets now. I think I see another baby blanket in the near future. So, what have you been knitting? Anything good for me to add to the Ravelry queue? I don't know how the blogging thing goes a whole month without being done, but there ya go. I am trying to be back on my blogging game a little more now. There is a lot of good knitting to share. 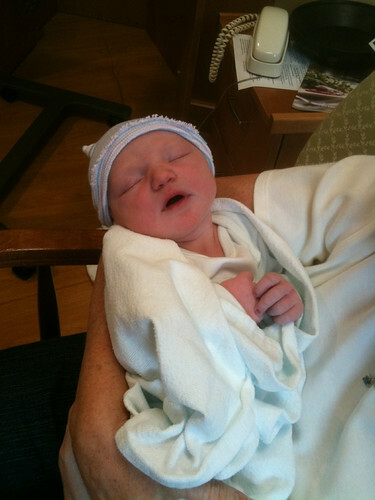 Oh, and the news that my niece finally arrived!!! Little Caitlyn Elizabeth was born on 6/11/10. She weighed in at 8 lb 6oz and 20.5 inches. Yes, she is sleeping in a cat bed! It's the only place my BIL could get her to sleep when they first arrived home! Upcoming I will be sharing my stealth knitting project that I mentioned a couple of times (because I gifted it to my niece after she was born). There has also been some shawl and sock knitting too.